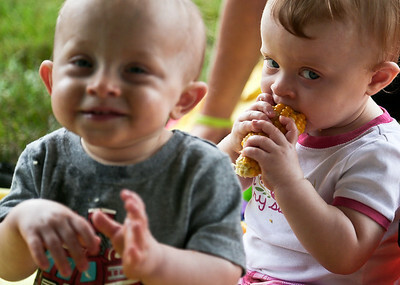 Josh Peckler - Jpeckler@shawmedia.com Addison Justen, 1 eats a cob of roasted corn as she enjoys the Annual Ringwood Picnic at the Ringwood Village Hall Sunday, August 26. 2012. Although rain was in the forecast for most of Sunday residents still came out to enjoy the food and other activities in Ringwood. 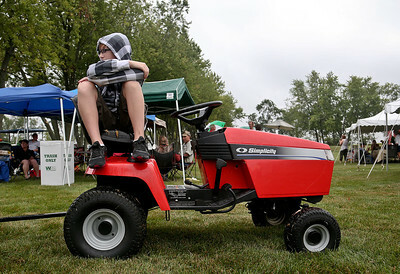 Josh Peckler - Jpeckler@shawmedia.com Justin Chrisman, 13 of Ringwood sits on a tracker during the Annual Ringwood Picnic at the Ringwood Village Hall Sunday, August 26. 2012. Although rain was in the forecast residents still came out to enjoy the food and other activities in Ringwood. Josh Peckler - Jpeckler@shawmedia.com Jeremy Tekampe of Wilmot, Wisc. 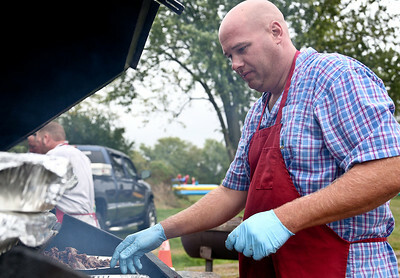 checks on roasted pork and beef on a grill during the Annual Ringwood Picnic at the Ringwood Village Hall Sunday, August 26. 2012. Although rain was in the forecast residents still came out to enjoy the food and other activities in Ringwood. Addison Justen, 1 eats a cob of roasted corn as she enjoys the Annual Ringwood Picnic at the Ringwood Village Hall Sunday, August 26. 2012. Although rain was in the forecast for most of Sunday residents still came out to enjoy the food and other activities in Ringwood.